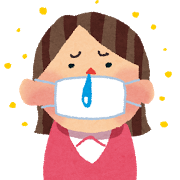 Recently everyone in Japan is talking about 花粉症（ = kafunshou) pollen allergy, hay fever. = Kotoshi wa kafunshou wa dou? = Nennen kafunshou ga hidokunatte kiteimasu. = Kotoshi wa kafun no ryou ga kanari ooi mitai desune. In 天気予報 ( = tenki yohou) ,weather report, also forecasts 花粉情報 ( = kafunjouhou), pollen forecast in spring. They said 花粉症 ( = kafunshou) pollen allergy, hay fever is mainly caused by 杉/スギ ( = sugi) Japanese cedar, so we also call it スギ花粉症( = sugi kafunshou) pollen allergy caused by Japanese cedar. • 鼻がくしゅくしゅする ( = hana ga kushukushu suru) having a light runny nose or light sneezing. Note : By the way do you know the sneezing sound in Japanese? 大丈夫（ですか）？ ( = Daijoubu desuka?) Are you all right? How about a runny nose? There is no actual sound of a runny nose but we describe it with ずるずる／ズルズル ( = zuruzuru) or だらだら／ダラダラ(=daradara) when you have a continuous runny nose. OK, today, I want to try something new. I will make a lesson out of “pocket tissue” (tissue in a small package) （Whaaaat!? :shock: ) with lots of sound files so that you can practice listening! You can use this lesson in two or three ways. First if your listening level is good enough, just listen to the sound file and see if you understand the whole thing. For those whose listening level is not that good but are good at reading, read the following text first to see if you understand it. We’ll break down the lesson and study little by little. The goal is to understand the whole text without reading the text. Nihon dewa machikado de yoku poketto tisshu wo muryou de kubatte imasu. Yoku miruto tissu niwa koukoku ga haitte imasu. Kyandii wo hitotsubu chirashi ni soete kubaru koto mo arimasu. Chirashi ni mono wo tsukeru koto de michiyuku hitobito ga uketotte kureru kanousei mo takaku narimasu. Sudoori suru hito mo imasu ga naka niwa mae wo nankai mo tootte tisshu wo takusan morau hito mo iru mitai desu. Watashi no baggu ya ie ni mo koushite moratta tissu ga ikutsu mo arimasu. Dakara nihon dewa wazawaza poketto tisshu wo kaukoto wa mare desu. Tisshu wo tada de morai narete iru node tama ni gaikoku ni iku to poketto tisshu wo omise de kawanakereba naranai nowa fushigi na ki sae shimasu. = Nihon dewa machikado de yoku poketto tisshu wo muryou de kubatte imasu. In Japan it is quite common to give away pocket tissue (pocket size tissue) on the street. = Yoku miru to tisshu niwa koukoku ga haitte imasu. If you see them carefully you can find advertisement in the tissue. = Kyandii wo hitotsubu chirashi ni soete kubaru koto mo arimasu. Sometimes they attach a piece of candy to a flier and hand them out. = Michiyuku hitobito ga uketotte kureru kanousei mo takaku narimasu. there is a higher possibility that passers-by will receive the flier. = Tisshu wo takusan morau hito mo iru mitai desu. I’ ve heard there are some people who get a couple of tissues by passing by the person who give the tissue away many times. = Koushite moratta poketto tisshu wo ga ikutsumo arimasu. *there are some tissues that I have received like that. = Dakara nihon dewa wazawaza poketto tisshu wo kau koto wa mare desu. = Fushigi na ki sae shimasu. makes me feel even strange. = Kaze no kisetu ya kafunshou no kisetu ni naru to hitobito wa tisshu ga tebanasemasen. yoku hana wo kamu hito no tame ni meikaa mo yori shitsu no takai tisshu wo kaihatsu shite imasu. tatoeba kochira! tokutei no konbini dake de kaeru harou kittii no hakoiri tisshu desu. •や ( = ya) ~ and etc. we can’t do without tissue. *have developed even higher quality of tissue. = Harou kittii no hakoiri tisshu desu. OK, now do you want to try to read what it says on the box? We have lots of “creative” product names. = Kono seetaa wa hadazawari ga ii. = This sweater feels good. •ハワイ限定商品 ( = hawai gentei shouhin) Products that can only purchased in Hawaii. Ex. お茶どうぞ！ ( = ocha douzo!) Please enjoy your tea. Ex. タバコどうぞ！ ( = tabako douzo!) Have a cigarette. = Kono hana serebu tte tsukau to serebu ni nareru no kashira??? = So I wonder if I will be a celebrity if I use this “hana serebu” (=”Nose Celebrity”) ??? and u notice how differnt people sneeze differently? 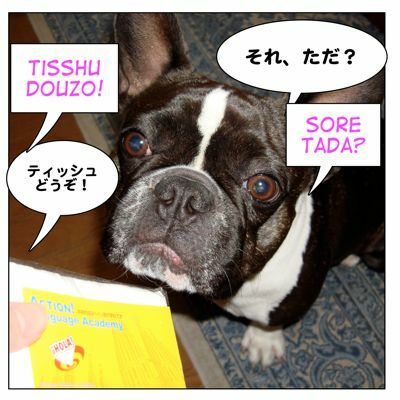 it’s the funniest thing でしょ！！？I think I sneeze くっしゃん and I usually sneeze 2 times, I noticed… what about sensei? You are very lucky that you don’t suffer from pollen allergy anymore. It is just miserable. くしゃみ? You have seen my superstitious lesson, right? If you sneeze twice, we think someone is talking about you. 助詞だけ勉強するよりも動詞や他の品詞と一緒に文章で覚えるといいですよ！　ex. 勉強をする　あなたに会いたい　学校に行く..etc. WOW! You have put in a lot of work in your posts. Those aimai expressions alway come up in the JLPT. I wonder how difficult the new level 3 will be??? This was a great lesson. I couldn’t understand all of the passage the first time but then I went through it bit by bit and it all made sense! This lesson really helped my confidence, so thank you. I also like how it is so practical and about every day things. I have a cold right now… I wish I had some 鼻セレブ tissues. I tried them when I was in Japan and they were heaven for my sore nose! 久しぶり！Great to hear from you again! Now you are an expert of “鼻セレブ!! !